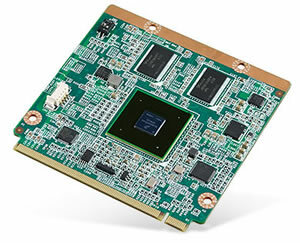 The ROM-7420 RISC-based Qseven module from Advantech, powered by an ARM® Cortex-A9 i.MX6 Dual core 1GHz high performance processor the module is capable of delivering multimedia on a low-power platform. The ROM-7420 is compliant with Qseven Specification 1.20 and features a compact size of 70 x 70 x 8 mm, feather weight of 21g and ultra-low power consumption of only 3W. Featuring an ARM® Cortex-A9 processor with 1GB DDR3 memory and 4GB flash on-board, the ROM-7420 also has a built-in 2D and 3D graphics engine supporting up to four independent displays, 2 x LVDS, 1 x HDMI, 1 x VGA, and support for full HD 1080P high quality video output. ROM-7420 supports not only Qseven standard I/O interface Ethernet, USB 2.0, USB 2.0 OTG, and PCIe, but also some additional functions beyond the Qseven specification: 3 x I2C, 1 x SPI, 4 x UART (2-wire Tx, Rx, TTL 3.3V), 8 GPIO w/3.3V level, and 2 CAN Bus 2.0B. Power consumption for ROM-7420 is only 3 watts at maximum efficiency, and less than 1 watt in power saving mode making the ROM-7420 especially well suited for portable devices and mobile communications. The fanless design and full HD support also make it ideal for various low-power applications in HMI/Signage, industrial automation, cloud computing and hand held devices. Above all the ROM-7420 is a very cost efficient solution for replacing old, inefficient, bulky systems and innovating your product design. The ROM-7420 is supported with the ROM-DB7500 evaluation kit carrier board which allows easy integration and design reference. Click here for more information and register for a product demonstration.